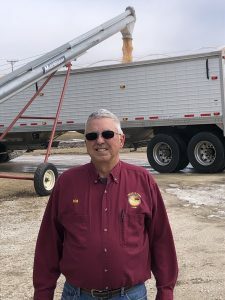 Ron’s family has been farming in Illinois for seven generations. He grew up on the farm working side by side with his father. In high school he took four years of agriculture in addition to machine shop. As a result of the machine shop classes he was offered a great job working for Caterpillar. “After lots of deliberation I decided my heart was truly in farming,” Ron says. In 1970 Ron began farming with his father and mother. Two years later Ron married his grade school sweetheart Denise, who joined their operation working together with the family. They raised Holstein dairy cows, beef cattle, farrow to finish hogs, chickens, hay, oats, wheat, corn and soybeans. Today their son Ryan continues the family tradition with his parents. Over the years, the farm has transitioned over to growing mainly corn and soybeans. Even after 49 years of farming Ron is still passionate about his work. He says, “I am amazed every spring when the seeds emerge. We plant one bushel of seed corn in the spring and expect to harvest 500 bushels every fall. It’s truly remarkable.” In all his years of farming Ron has seen some incredible innovations. The GPS in his computerized equipment insures his rows are straight allowing him to be able pay more attention to the operation of the equipment. There are no wasteful skips and fertilizer is able to be applied only where it is needed. Advancements in seed technology have increased yields and reduced the use of pesticides. Yet farming is not without its hardships. Inclement weather can destroy a field in a matter of minutes. Additionally, shaky market prices can force farmers to sell their crops at a loss. In the spring and fall the Frieders family work incredibly long hours to make the most of days with favorable weather.